My husband was so excited when his new crossbow arrived. He immediately tore open the box (like a kid on Christmas morning) and began assembling it. Within about 10 minutes he had the entire thing put together and was already looking through the scope out the front window. All the while he was telling me about all of the parts and how awesome it was going to be when he shot it. I thought he was kidding when he said okay lets head outside right after he was done. But as he got up from his chair I quickly figured out he was not. And with that I put on my shoes and jacket and followed him out back. I stood watching as he used the cocking rope to pull back the crossbow to prepare it for an arrow. I could tell by the way he was pulling on it that he was using quite a bit of muscle. Of course he says thanks to the cocking rope it was easy to do. After he did this he loaded it with an arrow. He had pulled one off the front of the crossbow already and had it stuck in the ground next to him so it was quick and easy to grab. Then he looked through the scope at his target and let it fly. 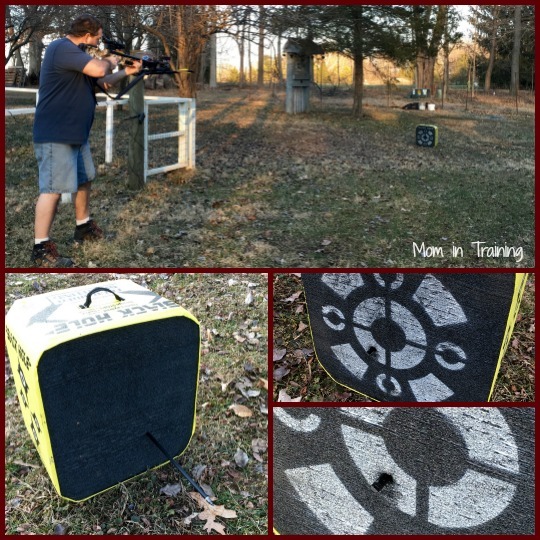 My husband said he was pretty impressed with the ease of use of the crossbow and just how much force was behind it when he shot the arrow. As you can see it went not only into his target, but part way out the back side even. This was his first shot and it wasn't too far off center really for right out of the box use. After this he stayed outside and made some adjustments and to get it all lined up. I of course went back in the house where it was warm and cozy. When he was all done he came in and told me the adjustments he made and that he was now excited about taking it hunting with him when the season comes back around. • Power Stroke: 15".Trigger Pull: 4 lbs. 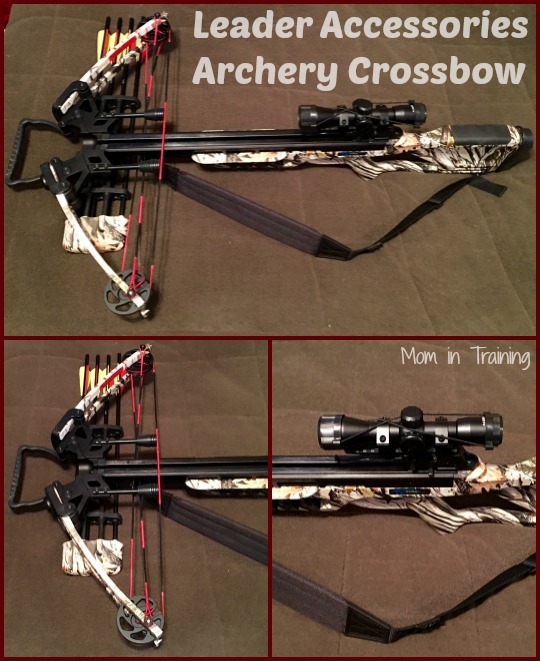 • Length: 35", Width: 23"
You can purchase this crossbow from Leader Accessories on Amazon.